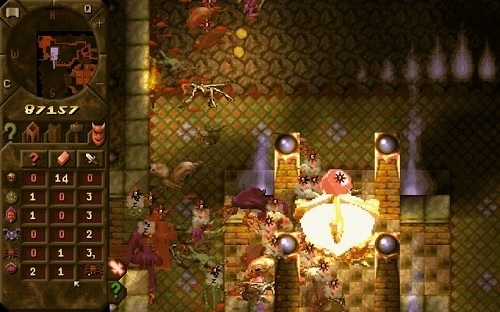 The original Dungeon Keeper is often credited as popularising dark humour in games and was released in 1997. Challenging players to manage their own dungeon while defeating various heroes the game was hugely successful and led to an equally satisfying sequel (Dungeon Keeper 2) two years later. Dungeon Keeper sends players on a journey to claim every single land in the game world that is currently in the hands of the goodly heroes or a rival keeper. As players progress the once green covered landscape will turn black to represent the players corrupting influence. 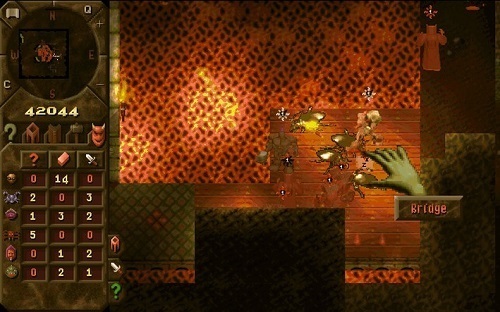 Within the game players are represented by a floating hand that can command troops, build rooms and all the other tasks required for an effective dungeon. By digging out land with the help of your Imps players can claim it for their buildings which in turn will attract various creatures to fight for the player. This includes powerful spell casters like the Warlock, hardened fighters like the Orc and Demon Spawn to the less useful Beetles and Flies. One of the core mechanics is the ability to pick up these creatures and drop them where required or slap them to “encourage” them to work faster. While the game is played from an isometric perspective players have good control over the camera direction and distance. For players that would rather explore their dungeon in a hands on manner you’ll have the ability to possess a creature and even take it into battle in first person. The most popular element of the game by far though is the dark atmosphere and humour spread throughout the game world. With the narrator constantly belittling you and your Horned Reapers running around killing your own creatures for fun it’s definitely a different experience. Dungeon Keeper is undoubtedly a gaming classic but if the graphics and old style of the game are just too much to look past then consider trying Dungeon Keeper 2 instead. A strategy management game with a dark sense of humour. One of the classic games in gaming. Possess your creatures and explore your own dungeon. Overall a truly enjoyable game. Not the best dungeon I’ve seen but managed to pick up a few tips.